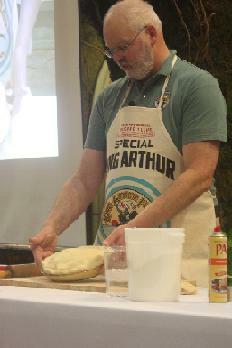 Perfect Pies & Tarts - King Arthur Flour comes to town! - Cooking With C.C. 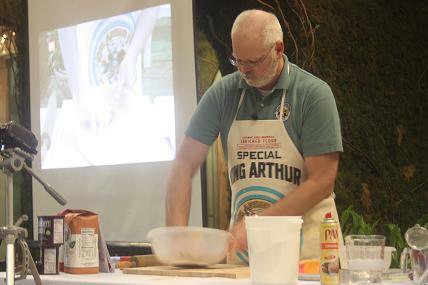 The next hint was about the apples – the instructor pointed out not to mix the dry ingredients with the apples until you are ready to build the pie. The sugar in the dry ingredients will start to pull the juices out of the apples – which if you mix before you start making the dough means you have a soupy mess of apples…. Next the pie was assembled, top crust rolled out and put together the final pie. It looked like it would have tasted great once they baked it – unfortunately – no samples, so I’ll have to take their word for it. Then we moved onto the chocolate tart – he demonstrated making the tart crust, filling the tart pan and then making a cream cheese filling for the tart. Mix dry ingredients. Cut one stick of butter into very small pieces. 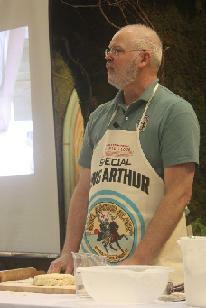 Using a pastry cutter (or forks, hands, etc), combine the flour mixture and butter until mixture is at least pea sized. Cut the second stick of putter into “pats” (about 3/8 to 1/2 inch). Cut the larger pieces into the flour mixture leaving these in larges chunks (up to “nickel” sized). Start adding the ice water a couple of tablespoons at a time. Using a bowl scraper, toss the flour and water mixture. Continue adding water until the dough begins to look “shaggy” and comes together into chunks. To test, squeeze some together in your hand and see if it hold together. If it crumbles or breaks, add a little more water. At this point, work the dough into a disk (He showed a great technique of pushing the first gathered dough down into the flour mixture and picking it up, gathering remaining flour in the bottom of the bowl and pushing down again – repeating until the dough is all together. This had the result of almost creating a “laminated” dough with distinct layers the trap the butter in pieces as you roll it out.) Divide the dough in half, gently work into disks. Wrap in plastic wrap and refrigerate for at least 25 minutes. After resting, take one of the disks and roll out the dough into a 12-13 inch round for a 9-inch pie pan. Transfer the rolled out pie crust to the pie pan and push into the edges of the pan. Now assemble the Apple Pie Filling (recipe follows) and put the apples into the pie pan. Roll out the second disk of dough and place on top of the pie. You may need to trip both the bottom and top crust so they overhand the edge of the pie pan by a finger width. Seal the pie by taking the top and bottom crusts and rolling them under (this creates 4 layers of pie dough and a continuous edge of the pie.) Vent the top of the pie with about 3 slits before baking. 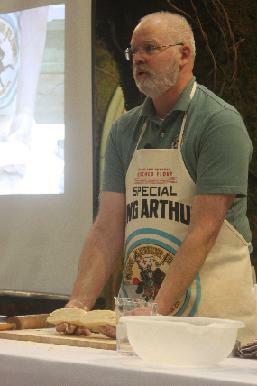 Now, just let it cool, slice, eat and enjoy – the only part we didn’t get to do at the demonstration…. 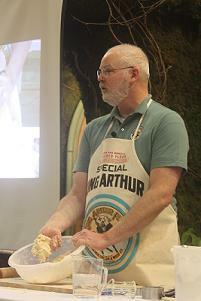 Dough split in half to get read to shape, wrap and rest. Notice all of the layers in the crust.